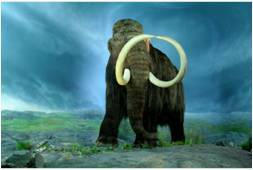 THE clocks are being turned back, way back, to the days of woolly mammoths and other exotic prehistoric creatures in a fun new interactive exhibition in Torquay. Torquay Museum launched a new permanent, interactive exhibition on Saturday December 14 , when children were able to participate in a fun-packed day of family activities, including fossil making. This Adventures in the Geopark exhibition will enable children and families to explore the amazing geology and prehistory of the English Riviera in a fun and interactive way. Generously financed by the Heritage Lottery Fund, Adventures in the Geopark tells some of the fascinating stories about the beautiful English Riviera. Designed by Forkbeard Fantasy multi media arts company, who has also done work for the Jurassic Coast, the new displays are an introduction to Torbay's unique geology, as well as the science behind the dating of Northern Europe's oldest human specimen – the famous Kents Cavern jawbone, on display at Torquay Museum along with other amazing prehistoric finds from the area. The new exhibition will enable Torquay Museum visitors to walk through Forkbeard's fantastic version of Torquay's 'London Bridge' – a unique geological feature seen from Torre Abbey Sands – and discover how the rocks have shaped the lives of people in Torquay. Visitors can listen to the rocks of Torbay tell their stories and gaze upon the kaleidoscope of colours that make up the local red sand. They can have a go on the 'Forensics CSI' table and explore how scientists — from local hero William Pengelly to the Natural History Museum's top expert Chris Stringer investigate prehistoric bones and other finds.